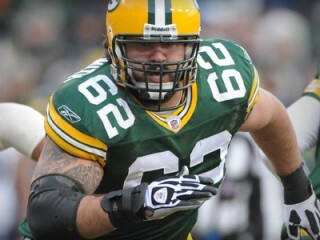 Evan Dietrich-Smith is an American football guard/center for the Green Bay Packers of the National Football League. • Only non-drafted rookie to make the Packers’ opening-day roster in 2009. • A backup at all three interior offensive line positions and contributor on special teams. • Set an Idaho State record with 44 starts on the offensive line, playing all five positions in his college career, including the last two at left tackle. • Became just the second player from Idaho State to play in a game for the Packers, joining LB Tom Toner (1973, 75-77). The only non-drafted rookie to make the Packers’ opening-day roster in 2009, parlayed his versatility at all three inside positions on the offensive line into a backup and special teams role in his first season... Played in only two games from scrimmage, at left guard and center, but became a regular on the extra-point, field-goal, and kickoff-return teams... Signed with the Packers as a free agent following the draft, after a four-year career at Idaho State that saw him play all five positions across the offensive line and set a school record with 44 career starts up front... Finished his college career as a left tackle, earning team MVP honors as a senior, but has worked as an interior lineman in the pros... Became just the second player from Idaho State to play in a game for the Packers, joining LB Tom Toner (1973, 75-77). 2009 SEASON: Played in 13 games, plus the Wild Card game, seeing time primarily on special teams... Was the only non-drafted rookie to make the Packers’ opening-day roster... At St. Louis (Sept. 27): Made NFL debut, seeing time on PATs and FGs... Vs. Dallas (Nov. 15): Saw first career action from scrimmage, coming in briefly at LG in second quarter when Daryn Colledge injured his ankle... Vs. Baltimore (Dec. 7): Posted first career kickoff return when he fielded a pooch kick at the Green Bay 30 and returned it 5 yards. Fumbled the ball, but teammate Desmond Bishop recovered... At Arizona (Jan. 3): Saw most extensive action of his career on offense, playing C for Scott Wells (rest) for the entire fourth quarter... 2009 Draft: Signed by Green Bay as a non-drafted free agent on May 1. A four-year letterwinner who set an Idaho State school record for the most starts ever by an offensive lineman, started 44 games (including the final 36 of his career) at various positions across the offensive front for the Bengals... Appeared at all five positions on the offensive line during his career, earning honorable mention all-conference honors each year... Spent his final two seasons at LT... Earned a B.S. in sports management... Senior season (2008): Started all 12 games at LT, earning team MVP honors after being a critical cog in an offense that averaged 370.8 yards per game... Nearly scored a TD in the season finale vs. Sacramento State (Nov. 22), catching a 5-yard pass on a trick play inside the red zone that set up a Bengals score two plays later... Was given the ISU Lifter of the Year Award at the team’s annual football banquet following the season... Junior season (2007): Started 11 games at LT for a unit that averaged 384.7 yards of total offense per game... Sophomore season (2006): Started all 11 games, five at LG, five at RT and one at blocking TE... Redshirt freshman season (2005): Saw his first action, starting 10 games at LG... Started the first eight games of the season, missed contest vs. Portland State (Nov. 5) with an injury, and then started the final two games, beginning a streak of starts that would carry him through the balance of his career. Born Evan Blake Dietrich-Smith... Born in Salinas, Calif. ... Single... Brother, Alex, is a Specialist-Team Leader in the 10th Mountain Division of the U.S. Army and recently had a son, Alex Jr., making Dietrich-Smith a first-time uncle... Is a close friend and former college teammate of New Orleans Saints DE Jeff Charleston... High school: Played along both the offensive and defensive lines as a prep at Salinas (Calif.) High School, lettering all four years in football... Earned the team’s ‘Golden Helmet Award’ as its most valuable player and was named first-team All-Tri-County as both an offensive and defensive lineman his senior year... Was named all-county by the Monterey Herald and Salinas Californian after helping his team to an undefeated conference record in 2003... Also lettered four times in basketball, leading his team to a conference championship as a senior and an appearance in the state semifinals... Community involvement: Participated in the United Way’s NFL Hometown Huddle project, helping to construct a new playground and re-paint existing playground equipment at Nicolet Elementary School in Green Bay... Also rang bells for the Salvation Army and attended the annual Pals Halloween Party to support Brown County Human Services... Hobbies/interests: Enjoys skateboarding, playing basketball and reading, naming Aldous Huxley’s Brave New World as his favorite book... Residence: Salinas, Calif.
View the full website biography of Evan Dietrich-Smith.